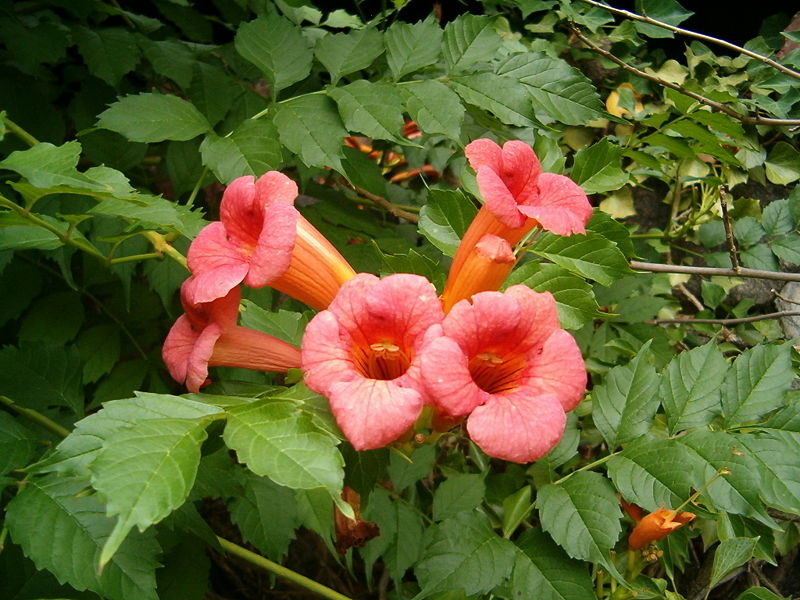 Campsis radicans - Native perennial Trumpet Vine, Trumpet Creeper. Very aggressive climber - needs strong support. Will climb anything nearby, so make sure you plant away from trees but near a strong arbor or trellis. Or it can be pruned and trained to grow as a standard tree form. Deciduous woody vine. Very vigorous. *Spectacular trumpet shaped orange flowers attract hummingbirds. Sap can be an irritant to sensitive skin, hence another nickname: Cow Itch. To prevent self-sowing all around, remove seed pods which form after the flowers fade. Perennial plant sent without pot. Price includes Delivery.